Recent release “Substantially Incapacitated” from Page Publishing author Christina Raughton is a potent reflection on a marriage, a career in law enforcement, and the unforeseen tragedy that ultimately led to the end of both. 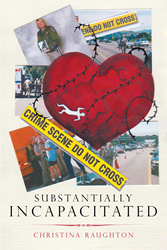 Christina Raughton, a retired peace officer with the California Highway Patrol, a certified personal trainer, and mother of two grown children residing in southern California with her beloved dog, Alice, has completed her new book “Substantially Incapacitated”: a powerful example of the unpredictability of life and one woman’s journey toward recovery and reinvention. Published by New York City-based Page Publishing, Christina Raughton’s poignant tale is an inspiration to anyone struggling to overcome a traumatic life-changing event. Readers who wish to experience this inspiring work can purchase “Substantially Incapacitated” at bookstores everywhere, or online at the Apple iTunes store, Amazon, Google Play or Barnes and Noble.